Women are a major asset in global climate action, protection of Oceans and promotion of Clean Energy, said Princess Lalla Hasnaa, chairwoman of the Mohammed VI Foundation for Environment Protection, insisting that women’s voices must be heard for the sake of inclusive, sustainable progress. Women are at the heart of actions for the climate, for the protection of oceans and for the development of clean energy, Princess Lalla Hasnaa told the nearly 700 attending leaders. “The transformative potential of women’s leadership is a major asset in global climate action. Through their commitment, their perseverance and their achievements on the ground, women are attesting to this on a daily basis,” she insisted, paying tribute to women in the countries of the South, mainly African women, for their struggle. 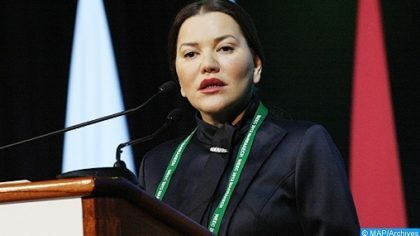 Women’s action guarantees and maintains collective vigilance, thereby reminding each and every one that the commitment of States for the climate must continue and lead to concrete results, Princess Lalla Hasnaa, the youngest sister of King Mohammed VI, said during the plenary session held under the theme “working together on climate change, oceans and energy”. She argued further that “women’s voices must be heard. The principles of fairness and equality command that. This is also required by the imperative of efficiency. Indeed, experience shows that progress – particularly inclusive, sustainable progress – cannot be achieved unless women are involved in it and benefit from it”. This applies to the challenges of inclusive growth and social development. This is even more true when it comes to the nagging, complex issues involved in combating climate change, protecting ecosystems and upholding the universal right to sustainable development, she added. In her address, Princess Lalla Hasnaa surveyed the moves undertaken by morocco to promote clean energy, protect the coastline and safeguard fragile ecosystems, particularly oases, recalling that the 2011 Constitution enshrined the right to a healthy environment and to sustainable development and that Morocco adopted an advanced national charter in these fields. She also said explained the goals of the Mohammed VI Foundation for Environmental Protection she is chairing, saying it strives to educate, sensitize and provide support. “This is an action for the very long-term…What is involved is more than just management, programming, organization and communication tasks… Above all, our work is about conviction,” she said. “As you may realize, my work at the Foundation involves, above all, an education and awareness-raising mission to promote sustainable development. Needless to say, children and young people are a priority for us,” she added. The action of the Foundation is aimed at raising young people’s awareness about sustainable development – from preschool level to higher education. “We do this through programs like Eco-Schools, Young Reporters for the Environment and the network of green universities,” she said noting that the Foundation seeks to introduce children, on the ground, to the reality of the sea level rise, droughts, desertification, urban pollution, global warming, and waste-related issues and threats to biodiversity. “We teach them to sort waste in Eco-Schools so they may reproduce the practice at home. We encourage them to choose a healthier, more environment-friendly diet, to grow their vegetables in the school kitchen garden, to turn organic waste into compost for fertilization and to set up localized irrigation systems to save water”. Later Thursday, Princess Lalla Hasnaa attended a panel on “Inclusive Climate Actions” focusing on the importance of fighting climate change and pooling efforts to reach tangible results for the well-being of the planet and humanity. On the sidelines of her participation in the forum, Lalla Hasnaa, met with Elizabeth Dowdeswell, Lieutenant Governor of Ontario, members of the Canadian Government and several figures of the Women’s Forum. The Women’s Forum for the Economy and Society is an international platform looking at major social and economic issues from women’s perspectives. Founded in 2005, the Forum seeks to give voice to leading women and men in politics, business, civil society and universities through various international meetings.